Social media is a double-edged sword. What we all know is that it can lift up a brand or a person at lightning speed. However, what social media users have always forgotten is that, on the other side, it can also devastate a brand, or a person’s career, completely. Although most of us think social media is used to connect with our friends, you may actually be reaching out to more audience in reality what with all the Shares and Likes of Facebook, for example. When things go wrong, social media becomes a microscope that amplifies your weakness - thousands times more. So, take caution when you feel the urge to post something online, for you never know how kindly – or not - netizens will take to your words. Think first and post later. On 18 March, Jesslyn Tan, a Miss Universe Singapore finalist, posted a photo of a middle-aged man sleeping in the MRT cabin with a hole on his shirt, and made light of it by labelling the look as “trendy”. Because of this incident, the victim Uncle Koh, could not take the comments and queries he received from patrons while at work. Even more saddening, Uncle Koh was embarrassed and felt that he had brought disgrace to his family. With ill intent or otherwise, such inconsiderate online actions could hurt the feelings of others while your morality will be questioned. This in turn hurts your reputation as well. There is no winner in such situations, so do not make fun of the less fortunate; show some sympathy instead. As our millennia generation becomes more open-minded, we tend to do crazier things. In 2012, Alvin Tan Jye Yee, an NUS law school scholar from Malaysia stirred up controversy for posting sexually explicit photographs and videos of his girlfriend and himself on his blog. The university’s Board of Discipline later “concluded that Alvin’s inappropriate conduct was detrimental to the reputation and dignity of the university”. The young man’s scholarship was terminated, and he and his partner now face charges back in Malaysia. Moral of the story: Do not expose too much of yourself, er, your personal life, especially if it does not align with social-cultural norms. In September, as an NUS undergraduate teaching award holder, Haniel Soh posted messages on Facebook and Instagram poking fun at one of his students who he claimed had body odour. He also complained that “teaching is boring” and rejoiced when one of his students took tuition hours to do his uncompleted homework. He called it “free money” to be earned. As a result of his no-brainer comments, MOE stepped in to investigate the case, and Mr Soh’s bright teaching career is in danger. No matter which industry you are in, it is important to uphold the professionalism all the time, even when you are on social media. Miss Amy Cheong, a former assistant director of membership at the National Trades Union Congress (NTUC), made headlines in October 2012 for posting insulting message on her Facebook page. In it, she disparaged Malays for what she perceived to be their low-cost and lengthy void-deck weddings. She also mocked their divorce rate. The post was quickly picked up by one of her friends and circulated in cyberspace. 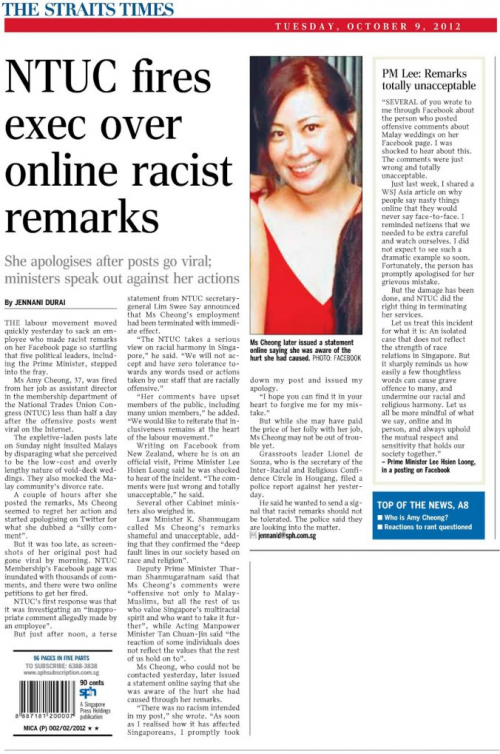 Within hours, Miss Cheong found herself branded a racist by netizens. The very next day, she was asked to leave and the police later administered a stern warning to her. Living in a multiracial and globalised city of Singapore, one must learn to respect each other’s cultural identities and religions, no matter in real life or online. Back in February 2012, a PRC national NUS student named Sun Xu, ignorantly posted on his Weibo that there were “more dogs than humans in Singapore”, after having unpleasant experiences with Singaporean “uncles”. Although there was always another part to the story which led him to such aggressive conclusions, it is such blunt judgemental words that can go viral and backfire on you. Consequently, Mr Sun’s scholarship benefits were terminated together with his industrial attachment contract at an MNC. Either in Singapore or overseas, if you encounter something, you have every right to complain about an individual incident or an individual person, but never carry it to a heightened societal level. You could easily raise an army of enemies against you.